As the leading platform for e-commerce on the Internet, Shopify has created a place for anyone to sell. If you have a Shopify store, you have many avenues for getting customers in and out of your digital door. You want to pick the best apps to give your customers the best experience. 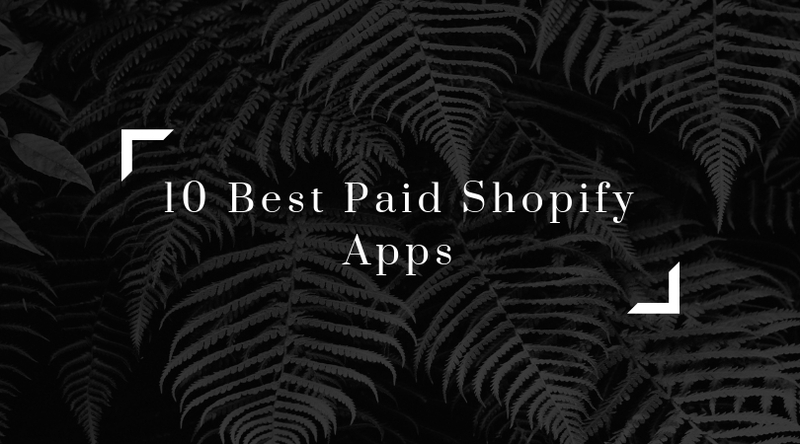 Here are the top 10 best paid Shopify apps for you to consider. What do you do when your customer wants to change the color or the design of your inventory items? What if they want to add more items to their order? After those changes, how do you collect their payments? We can edit a complete order from front to back using Edit Order. Using Edit Order, we can alter an incorrectly placed order (e.g. the customers have ordered an item in the wrong size or color), change their billing address (if the customer moves out), or change the price of an order after receipt. Audience Push is one of the essential apps for the Shopify store owner who advertises on Facebook. Once you are connected to Facebook, Audience Push automatically updates your Facebook Custom Audience list with each customer’s details into your store. This app is a huge timesaver that can make significant difference for your business. Your audiences are always up to date, thus have a real monetary value. Customers are going to be very satisfied. Exit Offers boosts your sales by helping you save customers who are about to leave your store’s website. It is described as “the instant second chance” to make money off abandonware customers. If visitors add items to their cart but then leave without completing their purchase, Exit shows them a special offer tailored specifically for them. The offer can be customized from top to bottom – it could be free shipping or a flat percentage off on any order. You can also split test offers from within the app to help you figure out which type of offer performs best for you. Eight out of 10 people who add items to their cart never buy for one main reason: the price. With this Shopify app, you can give special offers like free shipping, 24/7 support, a discount code, or virtually any other promo that you can think of. You want your customers to feel safe – no matter how large or small your website is. Consumers won’t buy from a store they do not trust. If they don’t feel comfortable entering their credit card details into your site, you’re going to lose out on sales. McAfee SECURE is an app that serves as a “badge of trust” for your customers to know that your site is safe and secure. Losing customers at the point of sale can be frustrating for any business, but it is also costly. Customers will also be impressed that you have the foresight to include McAfee SECURE, even if they are not necessarily scared of hackers. When you’re in need of sharing a wide range of products with an opportunity for virality in social media, then Outify may be the best app for you. With Outfy, you can take control of 15 widely known social networks from a single internet platform. It empowers you to effortlessly take control of these platforms to further enhance the reach of your e-store and pull more traffic. Not only can you promote your products to 15 widely known social networks, but you can also plan your social media sharing for the whole day, for the whole week, and even for several months! Your products get synced to your Outfy dashboard daily. Have you grown tired of having your email marketing, CRM, and analytics all over many various apps and dashboards? Then Metrilo is the most suitable app for you. With Metrilo, you can have everything in just one place. Metrilo automatically identifies sales channels that are valuable to your store. Metrilo also shows you where you’re losing business with their funnel reports. You can sample Metrilo with a 14-day free trial. To reap more results, visit the website to learn more about special packages. Smile.io is best known for its loyalty and VIP programs. With Smile.io, you can quickly set up and run your own rewards program. Rewarding loyal customers is important – they will most likely return to make repeat purchases. The app has free trials for up to 500 program members. The price range for a higher number of program members ranges from $59 up to $599 a month. Customer reviews are very important for the buying decision. One of the best apps for generating reviews is Yotpo. You can build trust, drive traffic, and increase conversions by adding more customer reviews on your site. Yotpo has free trials for packages up to 200 orders per month. But to maximize the results, the special package that costs $49 per month allows you to scale. Veeqo helps omnichannel retailers automate their whole back office to manage orders, ship to customers, sync inventory across multiple sales channels in real-time, view detailed reports, and take tight warehouse control – all these tasks are made possible through a convenient user interface. Plans start from $200 a month. SEO is one of the best ways to boost traffic and sales. For example, search almost any product on eBay, or any other large retailer. You will find it in Google at the top. When someone searches “men’s trench coat,” chances are they’re ready to purchase the exact product they searched for. No other form of marketing can match organic SEO. The better your SEO rankings, the more sales you make, and the more profit you generate. If you want to own search topics related to your store, then go to Plug in SEO – 90,000 Shopify store owners use the app. Think of it as your SEO assistant, constantly checking your shop and notifying you when there are any issues found. The membership is initially free. But if you want to maximize your sales results, then take advantage of the special package for $20 per month. The apps above will serve you well on the Shopify platform. Pick and choose according to your need, but you can’t really go wrong!